We took off for a long weekend in Santa Fe a few weekends ago. Hubs was turning 40 on Mother's Day, and we hadn't taken a kid-free trip in over two years (!!!) so my mom flew into town to watch the kiddos and we escaped. It turns out, it's a WONDERFUL place to go for a weekend getaway! If we'd have had more kid free time, I'd have loved to stay longer. For a town of about 65,000 people, there's a ton to do. Let me preface this by saying I've never been to a desert before. You have to fly into Albuquerque (which I still can't spell - thank goodness for autocorrect and spell check!) and I have to say... I was entirely underwhelmed with that city. There's sand everywhere and it's so monochromatic. The weather was nice but that's about the only kind thing I can say about Albuquerque. Santa Fe is about an hour into the mountains, and the further you got from Albuquerque, the prettier it got! 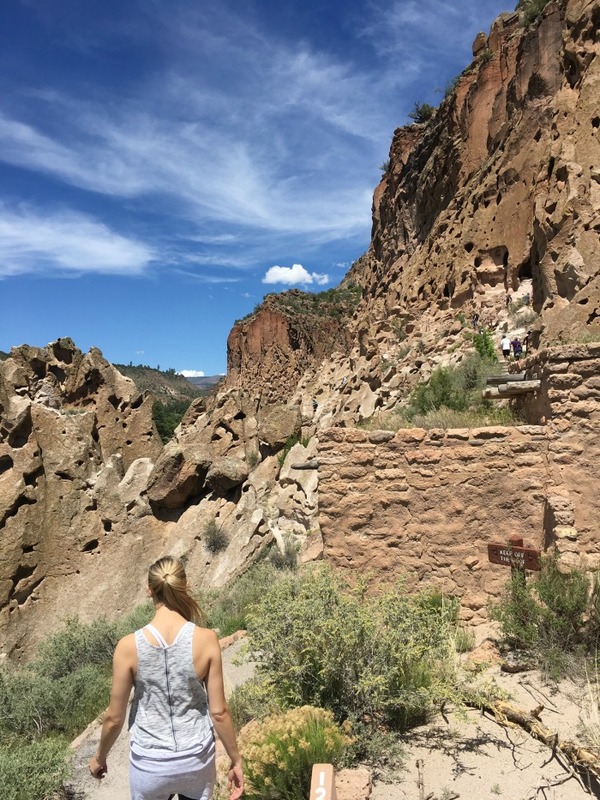 We took a trip out to Bandelier which was a perfect half day event. It's about an hour out of Santa Fe and we hiked for about an hour and a half. 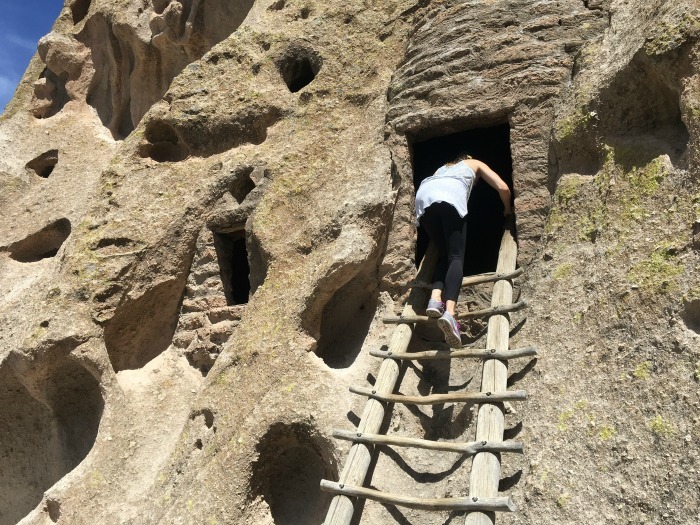 It's a historic site where you can see (and actually go into) caves that the natives used to live in in the Frijoles canyon. Pro tip: Remember that you're 7,000 feet up and need to wear sunscreen even when it's 65 degrees. 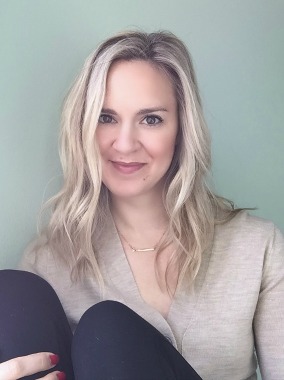 On Mother's Day (and hubs' actual birthday) we got massages at 10,000 Waves Spa and I have to say, it's one of the most beautiful spas I've ever seen. It's built into the mountain side and so tranquil! Beware though; there are TONS of stairs. You basically have to earn your spa stay with a good hike first! Santa Fe is built around a town square. In the square, independent artists and merchants set up their wares and crafts for sale. Bands play music and people hang out. Then surrounding the square, there are tons of shops, galleries and restaurants. We were there for four days and never went to the same place twice, nor did we get to see everything! Everything is walkable, and the town is historic (it's the first settlement in the U.S - even before Plymouth - settled by the Spanish in the 1600s). If you're looking for sunshine, mild temperatures, art, good food, and friendly people I highly suggest taking a weekend getaway to Santa Fe! Stay longer if you can, because you won't run out of things to do or good restaurants to check out. There are day hikes to go on, shops and endless galleries. It's the perfect getaway location. There IS an airport in Santa Fe, but it's smaller and more expensive to fly into. This sounds like a wonderful trip, a great little getaway! This looks like such a cool area! I'm big on hiking so I'd love to check out that one you went on. so glad you guys got to get away! I went to NM in high school for... INTERNATIONAL SCIENCE & ENGINEERING FAIR! I loved all the mountains, hills etc. But color was something I missed for sure. Yay for adult getaways! I have cousins in Santa Fe, but haven't been back since I was a teenager. The art scene is amazing and those massages sound fabulous. I can't believe that I live relatively close (Phoenix) and have never been to Santa Fe. I can't wait to make a trip -- thanks for all the tips! Paige, it looks like such a wonderful time! I am so jealous of your trip--it looks beautiful and relaxing! I have never been there, and never really been to a dessert town before (aside from Palm Springs when I was 11!) I am saving this for when we do get to travel some more! And happy birthday Kirk!